The Fit MasterCard is not a credit card tied to any fitness club. Instead, it is one of the latest card offerings from Continental Finance. It is a card that is target at those of you with bad credit and are in a rebuilding mode. Is it worth getting? Well, it's time to have to look under the hood. Another very important thing to take note of this card is that if your credit is bad, then you will need to put down a security deposit for get your credit limit. You will either be asked to put a $50, $150 or $500 deposit to get a $500 initial credit limit. Technically, it means that you will either need to put a partial or full security deposit. You will not receive any interest on your deposit and you can put up to a maximum of $2,000 as your deposit. Please be aware that there is usually a 7 day hold on your deposit initially. Since the Fit MasterCard is issued by Continental Finance, which also issue cards like Reflex Credit Card, Verve Credit Card and Surge MasterCard, let's compare it with these cards first. If you look at the table above, you'll realize that they are similar. They have the same fees and rates and you could also be asked to put a security deposit. As an unsecured card, the fees and rates are rather high compared to other cards. For example, Credit One Bank charges only an annual fee between $0 and $99. They do not charge any monthly maintenance fee at all. Other cards like Milestone and Indigo also only charge and an annual fee and have no monthly maintenance fee. If you have to put down a deposit, then this card would be essentially a secured card. As a secured credit card, this would possibly be the one with the highest fees to pay and interest rate as well. While most secured cards have an annual fee that ranges from $0 to $50, you would be be paying $125 annual fee in the first year and $96 + $120 (monthly maintenance fee) = $216 in fees from the second year onwards. 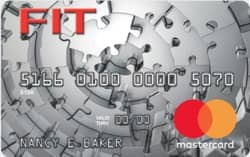 The Fit MasterCard is another one of the latest offerings from Continental Finance and like it the others, it has high fees and rates. It is still one of the old school sub-prime cards that charge both an annual fee and a monthly fee. The interest rate is right at the high end of the range (only surpassed by First Premier). If you are in a rebuilding mode, the lowest cost credit cards available are secured credit card because the annual fees are relatively low (though you have to put up a deposit). Over a two year period, you could be saving hundreds of dollars. For example, the Opensky secured card would be a good choice as it does not do any credit check and only has a $35 annual fee. If you are looking for an unsecured credit despite having poor scores, there are many which more reasonable annual fees and charge no monthly fees. Examples would include Credit One, Milestone credit card and Indigo credit card and even a card like Nascar credit card. There are even store cards with no annual fees like Fingerhut that charges no annual fee and have a track record of credit line increases and accepting people with low scores that would be a better choice. Havinng said that, if you get denied for any of these cards, then you might have to consider the Fit MasterCard.